This ice cream is served in a cone with a fishy twist: The cone is shaped like a fish. Taiyaki NYC serves up cones filled with either red bean paste or custard that are then topped with your favorite flavor of ice cream. 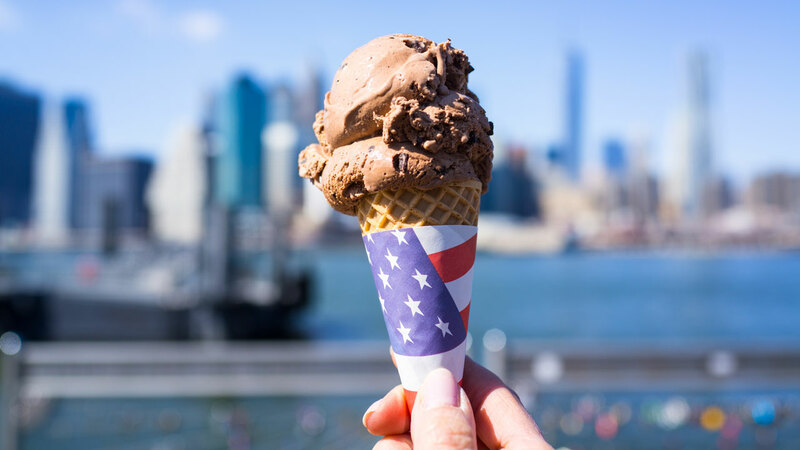 Check out New York City's ice cream carnival. Step right up to the ice cream carnival. Chefs Club Counter has been transformed into a carnival of themed ice-cream treats. If caramel popcorn and cotton candy are some of your favorite treats at the fair, then you'll love the ice creams inspired by them. This pop-up is open Monday to Sunday from 12:00pm to 10:00pm through the summer. NYC Ice cream shop requires customers to be 21 or older. This ice cream place is for adult ice cream lovers only. That's because each flavor is infused with alcohol. You can even try several flavors in a "boozy ice cream flights.". Check out interesting ice cream flavors. If Instagramable ice cream is your think, check out Soft Swerve. There, uou can order vanilla, but you can also find matcha, black sesame and ube. Ube, a type of yam, is so special -- and photogenic -- because of its natural purple color. Are you ready for the ice cream burger? The ice cream burger at Wu Kong is another confection that's ready for its Instagram closeup. This "burger" is made with a thin-hollowed out "bun" and a scoop of ice cream as the patty. This burger may just seem like any old ice cream sandwich, but trust us -- it's much more than that. They're the milkshakes that took the internet by storm. These creative milkshakes look like they came straight out of Willy Wonka's dreams. This is a treat for the people who like to drink their ice cream. So you want to celebrate National Ice Cream Day, but you're on a diet. The Taiwanese inspired snow ice at New York Frost Factory is just the treat for you. Snow ice is water based instead of cream based like ice cream, giving it fewer calories.